Warmer weather is now here consistently (finally!) and that calls for one of my favorite summertime meals - fish tacos! I made the following recipe the other day for lunch to use the cod fillets that have been hiding out in my freezer. I don't even recall why I purchased it to begin with. There must have been some recipe I wanted to try but never got around to it. (Don't you hate when that happens?) In an effort to make something quick, I seasoned the fillets with Old Bay seasoning*, steamed it in my Instant Pot, and stuffed it into a couple heated corn tortillas. Alternatively, you can solely use the sauté function to cook the fish too. When steamed, it came out wonderful and so easy! 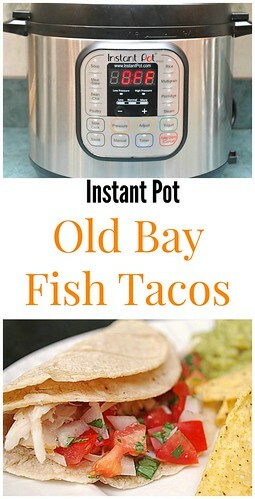 I served our fish tacos with a pico de gallo and cumin chile guacamole - both recipes are also included below. Add 1 cup of water in the IP. Season both sides of the cod fillets with Old Bay Seasoning. Transfer seasoned fish into a metal collapsible steamer basket and place in the IP. Once at pressure, the display will reflect 3 (the number of minutes you initially set - or 6 if frozen) and will begin to countdown to 0 minutes. When the IP beeps after steaming for 3 minutes (or 6 if frozen), turn the setting on top of your IP to VENTING. Doing so allows the IP to quickly release any remaining pressure (also known as QPR or QR). I use a wooden spoon to carefully turn the setting to avoid close contact with the potential steam. You may also want to turn your IP away from cabinets to allow the released steam to escape freely. The pin at the top of your IP will drop when all pressure has been released and it's safe to open. Meanwhile, Heat the tortillas as desired (whether its in a hot, dry skillet, oven or even microwave). I use two tortillas for each tacos to have a sturdy base for all the fillings. Open up your IP when the pin has dropped (allow a few minutes for this to happen). The IP will automatically default to the WARM mode. Press SAUTE on the IP and add oil and butter; heat until shimmering. Place the seasoned fillets in the skillet and brown on both sides. Cook through. 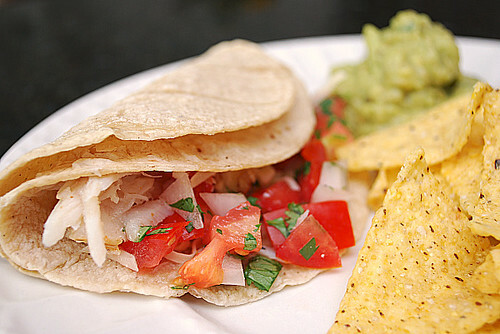 Once the fish has cooked through, remove from the pan and cut into pieces to fit inside the tortillas for the tacos. Combine all the pico de gallo ingredients in a bowl and use over tacos or eat with tortilla chips. For the Cumin Chile Guacamole: Combine all the cumin chile guacamole ingredients in a bowl and mash well to incorporate. Use over tacos or eat with tortilla chips.